NU Votes volunteers speak to students at a voter registration booth in Norris University Center in September. On Tuesday, the Association of Big Ten Students announced that more than 32,000 students were registered to vote through its campaign. The Association of Big Ten Students announced Tuesday that it has surpassed its goal of registering 30,000 students to vote through its “Vote B1G” campaign. As of Tuesday morning, the group had registered more than 32,000 students throughout the Big Ten. Student government leaders at the conference’s schools led the effort to increase voter registration at their respective institutions. 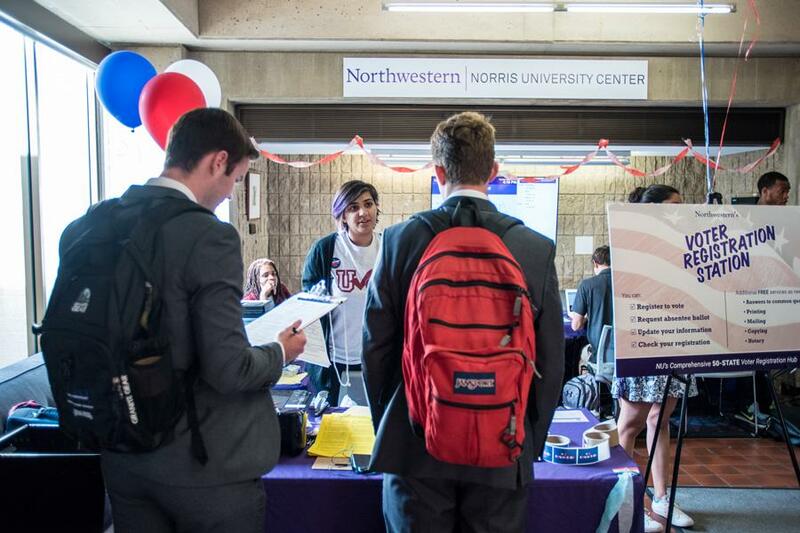 Medill junior Ross Krasner, public relations director of ABTS, a cross-university student government group, said NU Votes — an initiative started by Northwestern’s Center for Civic Engagement — contributed largely to the high voter registration at NU. The initiative created NUvotes.org, which allows students to register, review and change registration information as well as request absentee ballots before elections. In September, the University announced the online voter registration tool helped NU register a record 96 percent of voter-eligible incoming freshmen to vote. Krasner said the goal was to register as many students as possible across the Big Ten. At first, ABTS aimed to have about 10,000 people registered to vote, said William Dammann, director of legislative affairs for ABTS. However, he said the association later thought the goal was “very modest” and raised it to 30,000 registered voters. Dammann, a current student at the University of Minnesota, the institution currently leading the scoreboard with more than 8,400 registrations, said the increase fostered “friendly competition” among Big Ten schools and incentivized people to continue to compete. Dammann added that the group was always motivated to do something big, and the student response validated ABTS’ purpose. Robert Donahue, associate director of the Center for Civic Engagement, said voter registration is a group effort. The center, which speaks to faculty and legal counsel to provide accurate information through NU Votes, is in support of efforts such as the “Vote B1G” campaign, he said. According to U.S. Census data collected about the November 2014 election, a little over 42 percent of 18 to 24-year-olds are registered to vote. “The more we can get people involved and then make sure they are involved in smart, sophisticated ways, we’re going to have a healthier democracy,” Donahue said. Donahue said he wishes all students would register to vote after turning 18 and going off to college. He hopes people can make voting a habit and continue to get informed on candidates and political issues, he said. “If we want people to participate in our democracy, we need to make it accessible,” Donahue said.